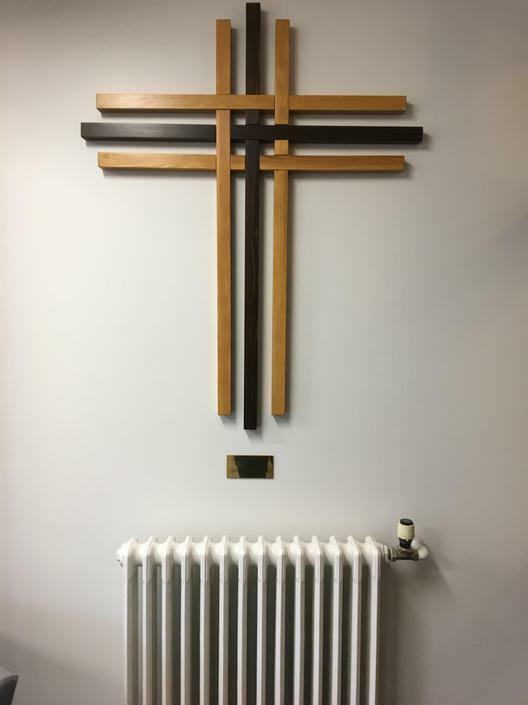 Last year, the Prayer and Care Group decided that they would like a cross in our entrance lobby. A cross was made by the father of a member of staff, in the style of our school logo. The cross was then blessed during Holy week by Father Carvill. The cross was admired by the RE Primary advisor who came to visit our school, an pupil over heard the conversation and approached Mr della-Spina and said that it would be nice to make him one. Mr della- Spina and Miss Hornsby liaised with the Director of Catholic Education, Peter Giorgio and commissioned an exact replica of our cross for the Diocesan Centre at Mackworth Derby. Pupils from our school presented the Director with the cross, had a tour of the centre and learnt that Miss Hornsby does all her learning there when she is not at school. The Prayer and Care Group suggested places to hang the cross and their suggestion was the front reception. Our gift to the Diocese Education Department now hangs and is seen by all who enter the building. The plague underneath explains that the cross was a gift from our school and has a scripture quote from Mark ' Let all the children come to me'.